© 2015 Korean Academy of Physical Therapy Rehabilitation Science. Received May 30, 2015; Revised June 14, 2015; Accepted June 16, 2015. Psychomotor imagery has been widely used to improve motor performance and motor learning. Recent research suggests that during visualization, changes occur in neurophysiological networks that make physical practice more effective in configuring functional networks for skillful behaviors. The aim of our pilot study was to determine if there was change and to what extent there was differentiation in modulation in electroencephalography (EEG) frequencies between visualizing a state of rest and a state of exercise performance and to identify the preponderant frequency. Quasi-experimental design uncontrolled before and after study. EEG brain wave activity was recorded from 0?40 Hz from nine cerebral cortical scalp regions F3, Fz, F4, C3, Cz, C4, P3, POz, and P4 with a wireless telemetric EEG system. The subjects, while sitting on a chair with eyes closed, were asked to visualize themselves in a state of routine rest/relaxation and after a period of time in a state of their routine exercise performance. The gamma frequency, 31?40 Hz, (γ) was the predominant wave band in differentiation between visualizing a state of rest versus visualizing a state of exercise performance. We suggest these preliminarily findings show the EEG electrocortical activity for athletes is differentially modulated during visualization of exercise performance in comparison to rest with a predominant γ wave band frequency observed during the state of exercise. Further controlled experimental studies will be performed to elaborate these observations and delineate the significance to optimization of psychomotor exercise performance. Recent research shows that neurophysiological correlates of visuo-motor learning occur through mental and physical practice . In addition the research has shown a facilitated effect of real-time cortical feedback in motor imagery-based mental practice training . This suggests that during visualization, changes occur in neurophysiological networks that make physical practice more effective in configuring functional networks for skillful behaviors . Gamma brainwaves, 31 Hz to 40 Hz, (γ) are considered to be a frequency related to optimal brain function. Gamma frequencies are observed in most brain areas and serve as a “binding” mechanism or synchronization between regions, helping to improve cognitive processing, memory, sensory perception and peak performance, both physical and mental [3?5]. Three healthy “high level” athletes (2 females, 1 male) who exercised daily to every other day and free of any immune, orthopedic, or neurological pathological condition were recruited. The subjects were recruited from a CrossFit? exercise program near Loma Linda University, Loma Linda, CA, USA. All study subjects were 8 hours NPO and were tested between 8 and 9 am to control for circadian rhythm. Baseline demographic characteristics of subjects including age, height, weight, body mass index, average hours of sleep, and exercise per day are given in Table 1. Upon arrival, the initial measurements of heart rate (HR) and blood pressure (BP) were obtained. A repetition of three HR and BP measurements was recorded and the mean was reported. The B-Alert?×10 telemetric electroencephalography (EEG), ten-channel system (Advanced Brain Monitoring Inc., Carlsbad, CA, USA) was used to acquire the EEG data. Following the 10?20 system, as shown in Figure 1, nine cerebral cortical channels (F3, Fz, F4, C3, Cz, C4, P3, POz, and P4) were used in this study. The reference electrodes were placed on mastoids, under the right collar bone (clavicle) and on the left fourth intercostal space on the chest and the electrode impedance was kept below 40 kΩ. Eye blinks and excessive muscle activity were identified and decontaminated by the system. The B-Alert?×10 wireless EEG nine-channel headset was placed on the scalp as well as appropriate placement of reference electrodes. Electrode impedance was then checked. To determine normalcy of EEG brain wave frequency per subject, baseline EEG data testing was performed. Individuals’ EEG brain wave patterns were assessed during performance of a 3-choice psychomotor vigilance task (3CVT). Tests used were the baseline alertness and memory profiler (AMP). The AMP obtains 5 minutes each of: a 3CVT, eyes open, and eyes closed. Baseline data was collected once for each individual before beginning the actual tasks of rest and exercise visualization. During the tasks of visualizing rest and exercise, the EEG B-Alert?×10 was recording the brain wave activity. The power spectral density μV2 (PSD) of wave band frequencies Delta δ (1?3 Hz), Theta θ (3?7 Hz), Alpha α (8?13), Beta β (13?30 Hz) and Gamma γ (31?40 Hz) were analyzed for each task. The subjects started with task of visualizing rest, where they were asked to visualize that they were their favorite place for resting for 2 minutes. Post-rest HR and BP were recorded immediately following rest. The subjects were then asked to visualize that they were performing their regular exercising routine for a 2 minute period. Post exercise HR and BP were taken immediately following the exercise task and again at an interval of 3 minutes and 5 minutes. Table 2 shows HR and BP data at pre-rest (baseline) and post-rest visualization task. Table 3 shows the HR and BP data post-exercise visualization. EEG PSD was acquired for 0?40 Hz for all nine cerebral cortical regions. PSD γ frequency was the predominant brainwave frequency observed in this pilot study. We observed that the left side of brain (F3, C3, P3) exercise visualization increased PSD γ frequency 314% compared to rest visualization, right side of brain (F4, C4, P4) exercise visualization increased γ frequency 465% compared to rest, and for midline brain (Fz, Cz, Pz) exercise visualization increased γ frequency 465% compared to rest. Also, for the left side of brain, γ frequency was greater for exercise versus rest visualization by 70.5% and 25%, respectively as compared to right side. These results show that γ frequency for visualization of exercise is greater for all areas of the scalp region assessed except for F4 during visualized states of exercise compared to rest. In addition, Figure 2 shows all frequencies (0 to 40 HZ) for δ, θ, α and β. The differences in PSD for γ frequency comparing visualization of rest with visualization of exercise are shown in the heat maps in Figure 3. This study shows the difference in brain activity with EEG monitoring during the visualization of the task of rest versus visualization of the task of exercise to the best of our knowledge, this is first study that has observed the differences in brain state during visualization of rest and exercise. PSD γ frequency was the predominant brainwave observed in this pilot study and hence our research questions focused on γ frequency modulation. These findings are preliminary, but suggestive that mental visualization can be an effective support in the configuration of brain neural functional networks for performing skillful behaviors . These visualization of exercise findings suggest possible neuronal reinforcement of neurophysiological networks. It appears that the neurophysiological and cognitive correlates are associated with predominance of PSD in “whole-brain” of the γ frequency. Further controlled experimental studies need to be performed to elaborate these observations and delineate their significance to optimization of psychomotor exercise performance and therapeutic outcome . Studies need to be conducted on larger cohorts with different athletic levels of conditioning. Although our study focused on gamma frequency but further research should be conducted to study possible variation in other EEG brain wave frequencies. Therefore, further expanded controlled studies will be conducted to elaborate our pilot observations and attempt to delineate the significance for optimization of psychomotor exercise performance. Fig. 1. 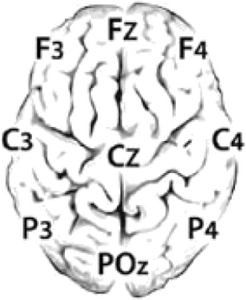 The nine cerebral cortical scalp regions were F3, Fz, F4, C3, Cz, C4, P3, POz, and P4. Fig. 2. Represents the power spectral density of the frequencies showing the overall pattern for the nine electroencephalography cerebral cortical sites assessed. GM: grand mean. Fig. 3. Heat Maps showing increased gamma activity in the brain during rest visualization task compared to exercise visualization task. GM: grand mean. HR: heart rate, BP: blood pressure. Bai, O, Huang, D, Fei, DY, and Kunz, R (2014). Effect of real-time cortical feedback in motor imagery-based mental practice training. Neuro-Rehabilitation. 34, 355-63. Allami, N, Brovelli, A, Hamzaoui el, M, Regragui, F, Paulignan, Y, and Boussaoud, D (2014). Neurophysiological correlates of visuo-motor learning through mental and physical practice. Neuropsychologia. 55, 6-14. Herrmann, CS, Munk, MH, and Engel, AK (2004). 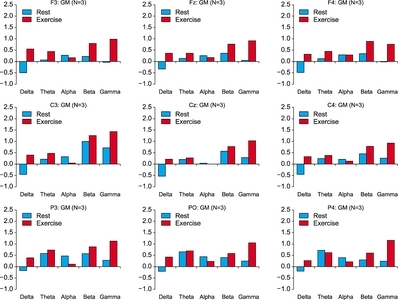 Cognitive functions of gamma-band activity: memory match and utilization. Trends Cogn Sci. 8, 347-55. Zich, C, De Vos, M, Kranczioch, C, and Debener, S (2015). Wireless EEG with individualized channel layout enables efficient motor imagery training. Clin Neurophysiol. 126, 698-710. Malouin, F, Richards, CL, Jackson, PL, Dumas, F, and Doyon, J (2003). Brain activations during motor imagery of locomotor-related tasks: a PET study. Hum Brain Mapp. 19, 47-62. Lebon, F, Collet, C, and Guillot, A (2010). Benefits of motor imagery training on muscle strength. J Strength Cond Res. 24, 1680-7. Dickstein, R, and Deutsch, JE (2007). Motor imagery in physical therapist practice. Phys Ther. 87, 942-53.